The European Central Bank slashed its growth and inflation forecasts for 2013, raising the prospect of a further easing in monetary policy next year, after it kept interest rates on hold Thursday. The ECB is now forecasting eurozone gross domestic product ranging from growth of 0.3% to a decline of 0.9% next year. That compares with a September forecast of between 1.4% growth and 0.4% contraction, and the OECD's latest projection of a decline of 0.1%. "Over the shorter term, weak activity is expected to extend into next year, reflecting the adverse impact on domestic expenditure of weak consumer and investor sentiment and subdued foreign demand," ECB President Mario Draghi said at a news conference. The eurozone fell back into recession in the third quarter, and many private forecasters expect the region's economy to contract further in 2013. Inflation was forecast to fall to between 1.1% and 2.1% next year, from 2.5% in 2012, and to between 0.6% and 2.2% in 2014, the ECB said. Draghi said the ECB continued to see downside risks to the economic outlook stemming from the eurozone debt crisis and the U.S. fiscal cliff debate, but had not changed its view on the medium-term risks to inflation. "Risks to the outlook for price developments are seen as broadly balanced, with downside risks stemming from weaker economic activity and upside risks relating to higher administered prices and indirect taxes, as well as higher oil prices," he said. The midpoint of the inflation forecast for 2014 is 1.4%, lower than some economists were expecting. The ECB's medium-term target is to keep inflation below, but close to, 2%. In a note published before the ECB meeting, foreign-exchange strategists at Citi said an inflation forecast of 1.5% may signal "that more rate cuts could come before long". The euro weakened against the dollar, trading down 0.3% at $1.30. 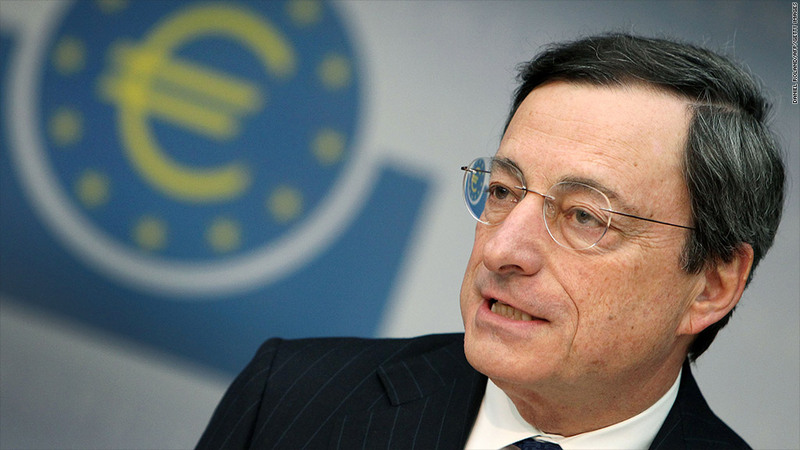 Defending the bank's decision not to relax policy further now, Draghi pointed to conflicting signals on the eurozone economy and the unchanged assessment of inflation risks. Asked whether a rate cut had been discussed Thursday, he said: "There was a wide discussion but in the end the prevailing consensus was to leave rates unchanged." Recent surveys have pointed to a slight pick-up, from very low levels, in manufacturing and trade sentiment. But the services sector remains depressed and unemployment continues to rise, hitting a new peak of 11.7% in October. The Bank of England also held interest rates unchanged at 0.5% and maintained the volume of its quantitative easing program at £375 billion, in line with market expectations. The outlook for the U.K. economy has weakened in recent weeks, but economists do not expect the bank to ease policy further in the near term, as inflation remains way above its target of 2%.